This is it. Sons of Anarchy Season 7 Episode 13 marks the final episode of this terrific FX drama, as viewers learn the fate of Jax and company. 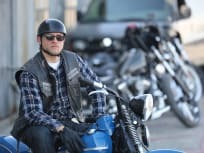 Tensions increase significantly on Sons of Anarchy Season 7 Episode 12 as Jax must make major decisions about the future of his club and his family. 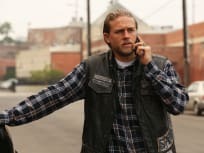 On Sons of Anarchy Season 7 Episode 11, Jax comes face to face with a very ugly truth about his family and he and SAMCRO must face the consequences. Sons of Anarchy Season 7 Episode 10 has SAMCRO involved in lots of love, death, the brutal side of revenge and Jax's son Abel asks a shocking question in "Faith and Despondency"
On Sons of Anarchy Season 7 Episode 9, SAMCRO deals with conflict with Indian Hills, a tricky deal with August Marks, and a devastating loss. 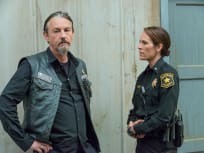 On Sons of Anarchy Season 7 Episode 7, SAMCRO makes an unlikely partnership to leverage a powerful rival but their strategy doesn't go quite as planned. "Smoke Em If You Got Em"
Lea Michele of Glee fame guest stars on this episode of Sons of Anarchy as Jax forms new alliances through more bloodshed and Juice's plan for escape takes a new turn. Yet another betrayal leads to more violence at the Stockton ports and things come to a head for Juice on Sons of Anarchy. 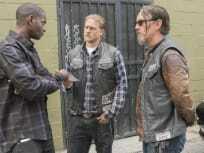 When Jax and the club try to make good on an old favor, it causes problems with a new alliances on Sons of Anarchy.